You’ll hear me say ova’ and ova’ that connecting with your Spirit Guides is super important during your psychic development journey. Why? Because your Spirit Guides are one source of the psychic impressions that you receive. Plus, your Guides are soooo wise and can empower you with their Divine guidance – so of course it’s a good idea to get nice and cozy with them! But connecting to your Spirit Guides can seem like a really abstract idea. I mean, how do you actually reach out and build a relationship with them? It’s not like you can have a meet and greet with them at a Walker Stalker Convention (if only). In fact, you can do it as soon as you’re done with this post and your latte! Pick a name for your Spirit Guide (you have many Guides, but let’s connect with one for starters), and start chit-chatting with them. Don’t believe it can be that simple? It is! Woo-hoo! I know, our logical mind loves to overthink things, but pinky promise me you won’t make this more complicated than it is, okay? See, it doesn’t matter who they are – and it doesn’t matter that you don’t know who they are on a conscious level (yet). Just pick a name you love, like Esmeralda (one of my faves), and dig in! Maybe name your Spirit Guide after a favorite character from a TV show or movie. Maybe you name them after one of your dearly departed family members or friends. Or, maybe you name them after your BFF imaginary friend from your childhood days. I happened to be in love with Ponch from Chips when I was a kid and it sounds like a cool Spirit Guide name, so why not? The whole point is to take the pressure OFF of connecting with your Spirit Guide. BTW, In case you were wondering, the gender of your Guide doesn’t matter, either. If you have a sense that your Guide has a masculine or female energy and want to name accordingly, great. If not, no worries. They don’t care, I promise. So Esmeralda might be a Nate — he won’t mind. Or, if you want, you could pick a “gender neutral” name you like, like Peyton, Riley, or Avery. Now here’s the key: Once you name your Spirit Guide… start chit-chatting with them! No, I don’t mean sit down and meditate (for ONCE). I literally mean to start generally chatting with them. And it’s not like you have to go around talking to yourself. 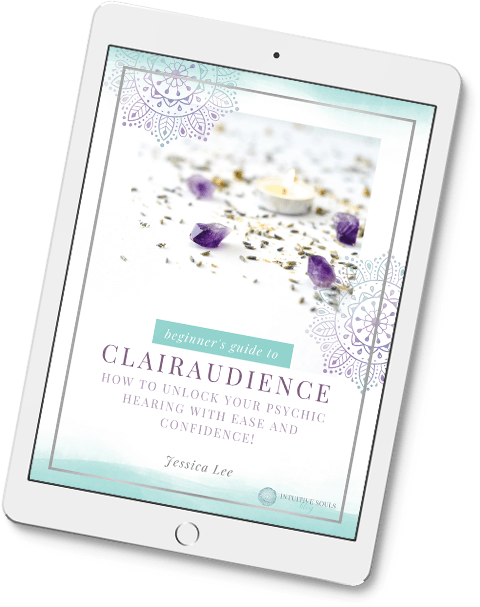 You can totally chat it up with your Guides in your mind – Spirit communication is telepathic, anyway! Of course, at first it will feel kinda weird. But give it a try! Like when you are making lunch and realize that your teenage son ate through all the lunch meat in record time, say, Oh, hey, Esmeralda, can you remind me to get turkey when we get to the store? Thanks! By doing this, you are building a relationship with your Spirit Guides… WITHOUT stressing out about it or putting too much pressure on yourself. And maybe when you get to the market, it pops into your head that you need turkey – or there’s a “clean-up on aisle 8!” so you have to go down the lunch meat section instead. You can also ask your Guide for help during everyday situations. Maybe after you grab your turkey and are standing in line at the store, a little old lady is counting out her bill in coins (ugh!) You could try saying, Esmeralda, I want to be patient, but who carries around a sandwich bag of dimes and nickels to pay for groceries?! Maybe then you notice that People magazine did a full feature on Jennifer Aniston’s daily diet and you’ve been wanting to get some nutrition tips. By the time the cashier is ready for you, you’ve totally calmed down and are grateful for the forced pause. Once you start to work your Guide into your everyday conversations, it will start to feel more and more natural. You may even find yourself doing it without prompt anymore! THAT is how you start connecting to your Spirit Guides in an effortless way! You’re doing great, so don’t stop now. Read more ways to connect to your Spirit Guides, here.